Adamant that he is being “martyred” for – he claims – uncovering in 2011 Discovery’s “decades of institutionalised defrauding of its members who had sustained injuries during road accidents”, Bobroff believes the Sunday splash in the Australian paper was because “Discovery…has now commenced doing business in Sydney and Melbourne” and no doubt want him out of the land down under. Presumably the continent is not big enough for their respective egos. In recent months there have been two South African news reports, one in Moneyweb and another in the Sunday Times, about Bobroff and his son Darren, also a lawyer. 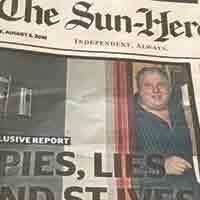 The Australian report appeared on 5 August in The Sun-Herald – the Sydney Morning Herald’s Sunday tabloid. The articles are fairly similar in that they both state that a “Red Notice” for the Bobroffs, issued by Interpol in 2016, is still valid; that their bank accounts in Israel containing “over R100-million” have been frozen thanks to efforts by the South African government; that the Bobroff family lives in luxury in a R25m home in the suburb of St Ives in Sydney; and that the SA National Prosecuting Authority is still trying to extradite the Bobroffs to South Africa to face criminal charges for ripping off RAF victims. They also state Ronald is looking to practise law in New South Wales and that Darren runs a successful property business there. 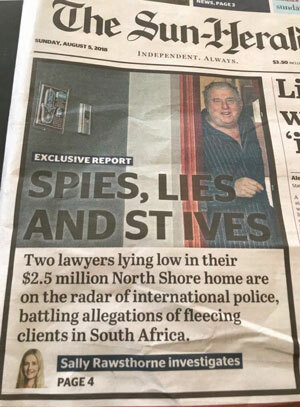 Ronald – who told the Australian paper in August that he was living in “reduced circumstances”, “on the smell of an oil rag” and that his AU$2.5m home in St Ives was “not much” – now believes the Australian journalist is part of a cabal secretly out to get him. This view was expressed on his own website www.bobroffronald.com. The website’s opening sentence, all in capital letters, states that the site provides “the facts not the fiction as to what’s really behind the relentless vendetta by the multi-billion-rand public company Discovery Limited, it’s highly paid legal army and their proxies on Ronald Bobroff, Darren Bobroff and RBP Inc”. Bobroff snr seems to see himself as John Lennon’s Working Class Hero – like the working class folk he ripped off. In response to the Australian article, he authored a 4,000-plus-word reply, claiming the Sun-Herald journalist Sally Rawsthorne was working with a “Discovery gang” that included Noseweek and Carte Blanche (and occasionally Noseweek) journalist Tony Beamish, Graeme Hosken from the Sunday Times, and “Discovery’s Jeffrey Katz”, one of the company’s various in-house attorneys. Ronald and Darren, who were partners in and directors of personal injury law firm Ronald Bobroff & Partners (RBP) in Rosebank, Johannesburg, are accused of swindling their clients, all claimants of the Road Accident Fund, of up to 40% of their claim made against the fund when the law only allowed them to charge their client up to 25% of what was successfully claimed against the RAF. They have settled with some but according to the Sunday Times, are still in dispute with former clients to the value of R12m. They are alleged to have netted over R100m through their gambit, shovelling it offshore, protected by a series of trusts. If the Bobroffs return home – having skipped the country in 2016 – they will face charges of fraud. On their website it is claimed that both Ronald and Darren are innocent and claim that Rawsthorne is a “scoundrel”. It unpacks, complete with links, the alleged conspiracy against them orchestrated by Jeffrey Katz. It also makes inappropriate bizarre and unrelated claims, that Carte Blanche reporter Beamish is a “Discovery-hired media assassin” who regularly “entertained one of South Africa’s most senior judges” – whom they describe as “a reformed alcoholic and drug addict” – at Beamish’s villa in France, and that former RBP staffer Cora van der Merwe was “trained by the South African Navy in counter espionage and had been sent to a Russian University to study allied topics”. In conclusion Bobroff declares: “Perhaps the clearest indication of collusion between Rawsthorne and Discovery’s Jeffrey Katz, his media assassin Beamish and accomplice Graeme Hosken of the Sunday Times appears from their all following each other on Twitter, and Katz tweeting Rawsthorne’s article within minutes of her doing so. “The question may rightly be asked how and why at this particular time and day would these corrupt conspirators be following each other and tweeting about Rawsthorne’s obligingly delivering the goods – served as a special present for Ronald’s birthday which is on the 7th August. Ronald’s scorn for anyone who thinks he’s a stand-up crook has always been evident. On the same website he dismissed Noseweek of being a “fringe publication”, while in 2012 when he was still somebody in the Law Society of the Northern Provinces he called Noseweek a “gutter publication… filled with half-truths and malicious speculation designed to titillate its minimal subscribing readership”. In a letter to the society he went on to declare: “It is beneath my dignity [as a] respectable attorney to endeavour to respond to this gutter journalism”. In that issue, Noseweek revealed that a report by top forensic accountant Vincent Faris, filed at the North Gauteng High Court in 2014. found there was “sufficient evidence to prove contraventions of the Income Tax Act, the VAT Act, the Companies Act, the Attorneys Act and the Rules of the Law Society of the Northern Provinces” by Bobroff and son. The action resulted in father and son being struck off the Roll of Attorneys.